and the timid wood owl's nightly sobs. One of the most vibrant voices of our time, Adam Zagajewski is a modern master of the poetic form. In Asymmetry, his first collection of poems in five years, he revisits the themes that have long concerned him: the enduring imprint of history, the beauty of nature, the place of the exile. 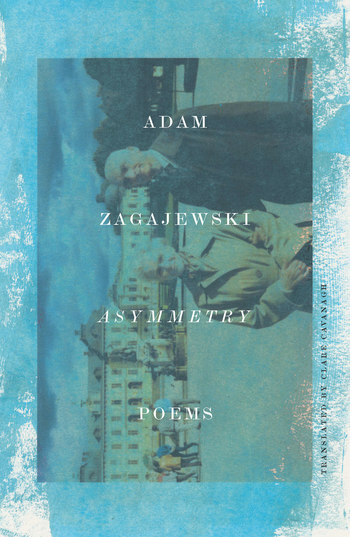 Though as sanguine as ever, Zagajewski often turns to elegy in this deeply powerful collection, remembering loved ones he’s lost: a hairdresser, the philosopher Krzystzof Michalski, and, most poignantly, his parents. A moving reflection on family, the sublimity of everyday life, death, and happiness, Asymmetry is a magnificent distillation of an astounding poetic voice. Adam Zagajewski was born in Lvov in 1945. His previous books include Tremor; Canvas; Mysticism for Beginners; Without End; Solidarity, Solitude; Two Cities; Another Beauty; A Defense of Ardor; Eternal Enemies; and Unseen Hand—all published by FSG. He lives in Kraków, Poland. Clare Cavanagh is a professor of Slavic languages and literatures at Northwestern University. Her book Lyric Poetry and Modern Politics, received the National Book Critics Circle Award for criticism. She is currently working on an authorized biography of Czeslaw Milosz. She has also translated the poetry of Wislawa Szymborska.